Our latest range of floor rugs; two linear designs made using our lovely undyed, natural Real Shetland yarns. 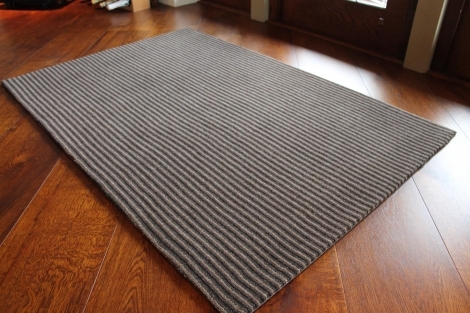 The rugs weigh in at 60oz/yd2, are woven in Yorkshire on a natural hessian backing and are 5 x 3ft in size. Hand sealed and finished, these floor rugs make a lovely addition to any existing floor covering, especially as winter draws in. Continuing in the tradition of all our Real Shetland products, every element of production with these floor rugs is kept entirely in the UK... we use wool sourced exclusively from the Shetland Islands, where we sort our wool before scouring and (if necessary) combing it ourselves in Yorkshire. We support local industry and use the most environmentally friendly processes possible to give you a natural, authentic product that encapsulates the heritage of Shetland and our traditional Yorkshire textile legacy.